Schools have an important role to play in developing a more sustainable London, through addressing their own environmental impact and educating the community in how to take action. We work with schools throughout London to achieve practical solutions to environmental challenges, such as installing solar panels and energy efficiency measures. Many of our services also help schools to make savings on their fuel consumption and create an improved learning environment for staff and pupils. We also help schools integrate energy issues into the curriculum, offer advice and training to staff, and create links with the local community. Travel is a major issue for many schools, with its impact on pollution and road safety. We have experience of producing travel plans to enable children to get to school without having to rely on cars, therefore reducing the problems of the school run. Please see our Resources page for case studies on previous projects we have completed with schools. 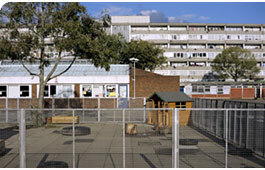 For further information on how we can work with your school, please email us or call 020 7582 9191.